You might remember that I wrote about vegan coconut condensed milk in my baking with coconut products article. The truth is, this ingredient is such a classic that it really deserves its own recipe post. 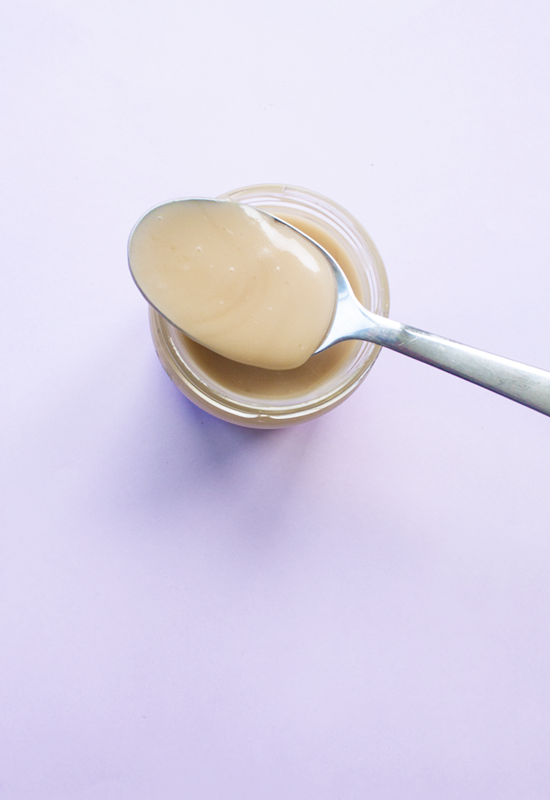 You can use condensed coconut milk to make vegan fudge, pudding, pies, tarts, ice cream, dulce de leche, in hot or cold drinks and to marinate in savory dishes. Most of these traditional recipes contain dairy condensed milk and since it’s something so specific, you can’t really replace it with any other product. I was so happy to discover that you don’t need any dairy to recreate it. This coconut version is as good as the original and I personally like it much better. Since it’s 100% dairy free, it’s perfect for vegans and for people who don’t eat dairy. It’s so creamy, rich, gooey and sweet, you will love it! 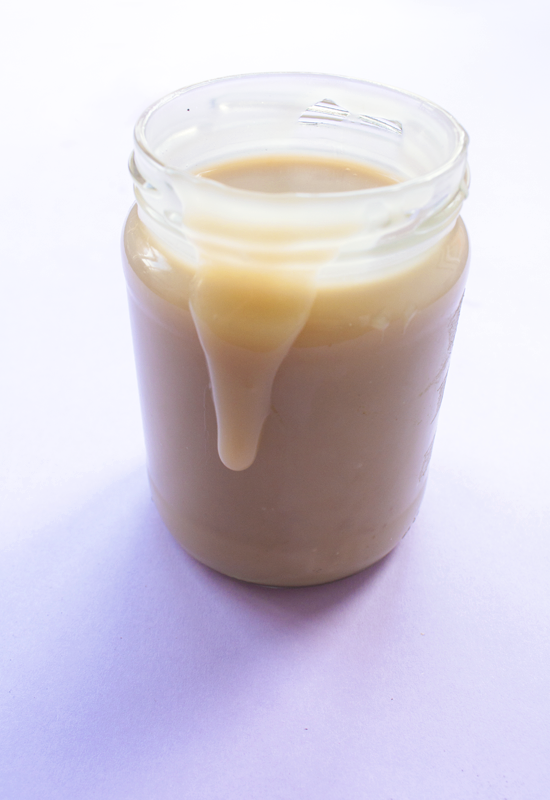 This 2 ingredient vegan coconut condensed milk is super easy and fast to make. You only need full fat coconut milk and coconut sugar, that’s all. 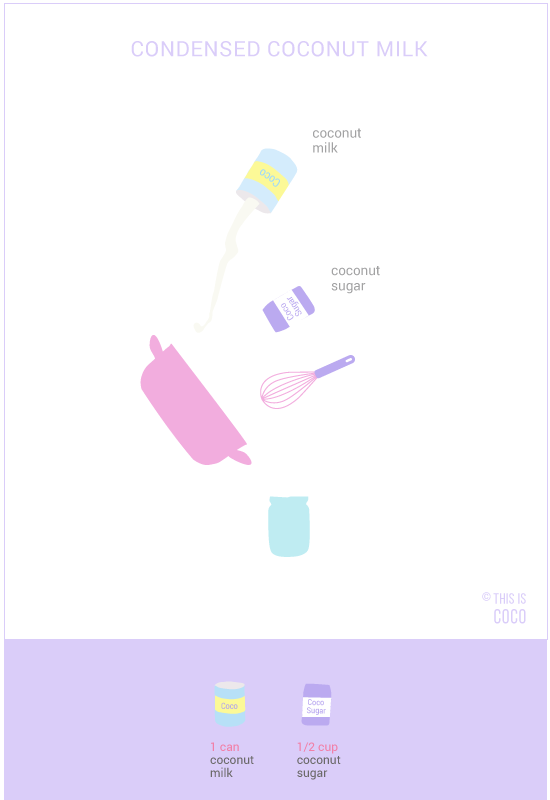 If you want to make your own coconut milk from fresh coconut, take a look at this recipe. Whisk the coconut milk and the coconut sugar in a saucepan over medium heat. Stir regularly and bring the mixture to a low simmer. Let it simmer for about 40 minutes, but keep stirring. The coconut milk will become darker and thicker and will reduce by about half. When ready, remove from heat and pour the mixture into a clean glass jar to fully cool off. It will thicken even more when you put it in the fridge for a few hours. If you are not going to use everything at once, store the rest in a sealed container in the fridge. It will keep for at least a week. Some people say it even lasts them for a month, but I alway finish mine before that, so I’ve never tested it. I use this vegan coconut condensed milk to make delicious two flavor fudge; chocolate and peanut butter. Everyone loves it and it it’s always gone in no time!